Craft beer is big in South Africa. In the past three years, the number of breweries has tripled, with close to 120 found across eight of the country’s nine provinces (despite the arid climate, perfect for beer drinking, the Northern Cape is still ale-less). While many of these breweries are found in garages and industrial parks, they’re not just confined to business areas – microbreweries are popping up on farms and small town high streets, nestled among mountain-tops and dotted along the coast from Cape Town to Zululand. Here are 10 particularly pretty places to stop for a pint. Raise a glass of craft beer to Ceder Brew, a microbrewery with a conservation strategy. With sales of hipster craft beer exploding in South Africa, it’s novel to find a brewing company focused on raising conservation awareness while brewing fine beers. Ceder Brew is the brainchild of sisters Tania (on the left in the photo) and Melanie, who’re part of the seventh generation of Nieuwoudts farming on Kromrivier in the Cederberg. What began as a hobby has grown into a thriving business – they produce 100 litres of beer per day – and the sisters are involved in every process, from brewing to label design. Ceder Brew, It’s easy to get lost in the Cederberg. Even in daytime, navigation to the farm where Ceder Brew is situated can be tricky. So fill your tank before you leave Ceres and have your map handy. There’s no fuel after Op Die Berg yet still cars arrive on empty tanks. Seventh generation dwellers on their farm Kromrivier, Melanie and Tania Nieuwoudt do not fit in any mould. A PhD in biochemistry, and an MComm in Logistics are but the beginning of their distinctions. If subtle, faultless elegance is what you’re after in beer, you won’t find anything better. I’m tempted to call this way of brewing feminine, in much the same way that burgundies are described in the wine world. Their labels, immaculately designed by Melanie, allude to another dimension of the time-bubble that is Kromrivier − conservation. 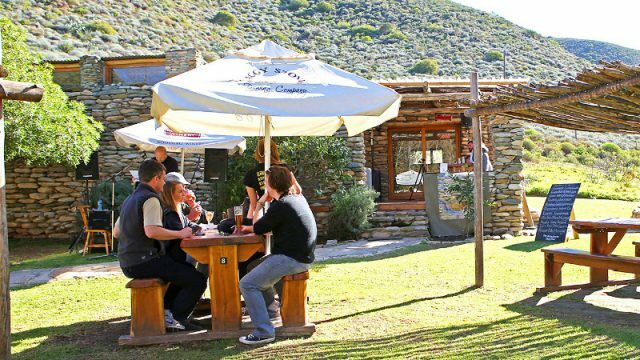 Part of the Cederberg Conservancy, the Nieuwoudts are piloting an effort to extract alien fish and return endemic species to the river, some the subject of their beer names. A tasty Pumpkin Ale, redolent of fritters, and a beautifully fragrant Cherry Blonde named Sarie Marais, round off their staples: Catfish Pale Ale, Sand Fish Weiss, and Chubbyhead Stout. Ceder Brew sisters taking on the Big Boys of Beer! Meet The Brewers at the Zomato Meetup!